At January 30th broadcast of MBC ‘News Magazine 2580′, the main topic surfaced was titled ‘JYJ and Kara, why are they?’, the topic focused and brought in recent ‘KARA situation’ and JYJ conflict with their former agency SM Entertainment in the spotlight. JYJ Kim Junsu, Kim Jaejoong, and Park Yoochun applied provisional injunction against former agency SM Entertainment in 2009, and afterward they started to do activities under name JYJ. However despite the popularity of JYJ as a group, due to interest relationship among SM Entertainment and many local broadcasters, they haven’t gotten proper air time in music program to do music activities ever since. Meanwhile, ‘News Magazine 2580′ also analyzed the complicated structure of entertainment industry where many entertainment companies are placing bet by investing huge costs to their artists so that they can generate income for them. The continuous dispute between artists and their agencies that didn’t meet amicable results were put as the indicator. This drama is going to be a big production; it is already reported to have a budget of 10,000,000,000 WON, which equates to nearly $9 million dollars. The drama will feature a united Korea (no separation between South and North), the united nation’s president, and his National Intelligence Director. The president’s role is most likely going to go to Jang Dong Gun and Ha Ji Won is slated to be the female lead. Jaejoong is supposed to be play the Director. Jang Dong Gun has revealed recently that he is interested in starring in this drama. Additionally, Ha Ji Won has expressed that she would like to join this production as soon as filming for her new movie ends. The filming will begin in June and July and it will start airing in October. It’s here! The package which contains memories of JYJ’s first album “The Beginning” and their success at the Seoul Concert! Singer Lee Sora picked Xiah Junsu as the male artiste she most wanted to sing a duet with. Cable music channel Mnet Media, who recently made amends with SM Entertainment, is voluntarily taking time out to promote the group ‘TVXQ’ (U-Know Yunho, Choikand Changmin). ‘Tap! TVXQ’ will air on February 2nd and 3rd and will feature footage of 48 hours in the life of TVXQ. The clips will be aired in a guerilla method with no pre-scheduled times. Mnet stated, “No one knows how many clips there are, how long they are and when they will be aired,” and “That means that people will have to tune into MNet all day long if they don’t want to miss a single clip.” The footage will also show the rehearsal process and behind the scenes moments of the ‘M! Countdown’ episodes that aired on the 20th and 27th. 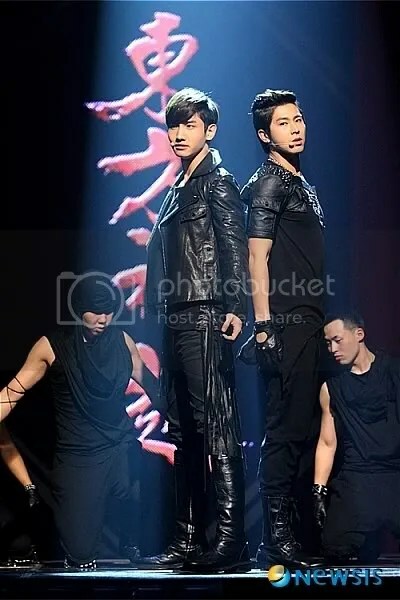 However, TVXQ did not set aside time to create this program. These clips were created by Mnet following TVXQ around with cameras. TVXQ appeared on ‘M! Countdown’ on the 20th at the Sangam-dong CJ E&M Center, their first appearance on an Mnet program in two years. This was because SM cut all ties with Mnet after the latter’s ‘Mnet KM Music Festival’ that was held in November, 2008. The entertainment industry sees TVXQ’s appearance on ‘M! Countdown’ as the restoration of ties between SM and Mnet. However, the two companies are still in an uncomfortable standing with each other. Many criticize that both are doing nothing but trying to benefit from the situation instead of trying to resolve it. 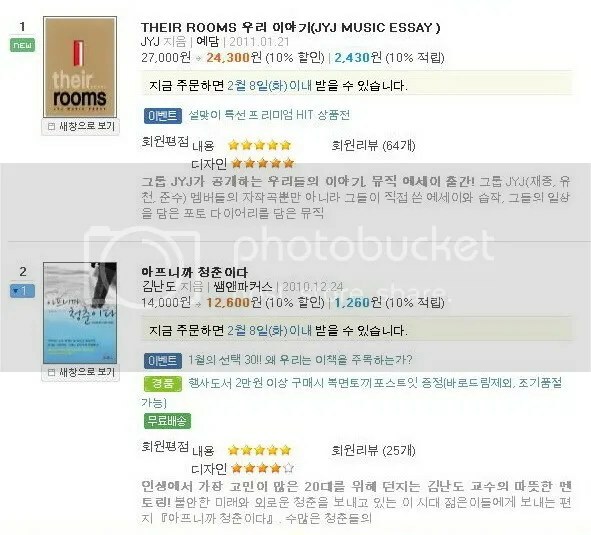 SM and Mnet began to clash with a problem regarding music distribution in 2008. In 2009, SM disallowed its artists from attending the ‘Mnet Asia Music Awards’ because it questioned the impartiality of the judging. JYJ’s American fans released a full-page ad in a daily newspaper in LA. 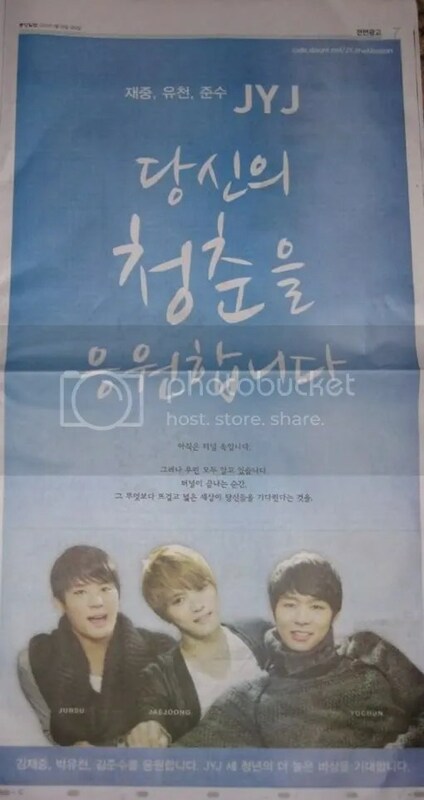 JYJ’s Korean American fans released a full-page ad cheering on JYJ in the entertainment section of the LA Joongang Ilbo on the 28th titled “We Support Your Youth”. On the other hand, JYJ’s domestic fans garnered attention when they began a “We Support Your Youth” bus campaign on the 27th in major cities such as Seoul, Gwangju, Daejun, Daegu and Busan. A total of 120 buses will be used for the campaign and it will go on for one month.